Isle of Man Post Office Chairman Ray Harmer presented internationally acclaimed artist and designer Roger Dean, with a framed set of stamps on Friday evening (19th August). 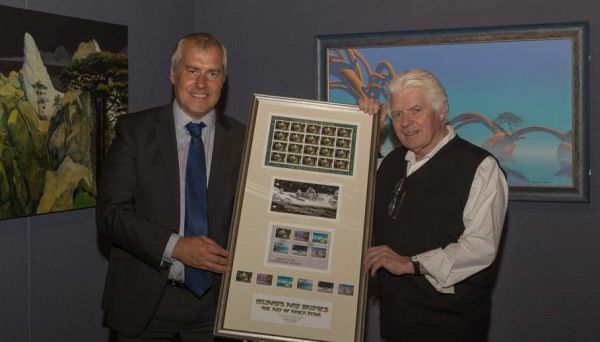 The presentation was made at a private viewing of Roger's landmark exhibition titled "Islands & Bridges" at the Manx Museum in Douglas, which has been specially commissioned for the stamp collection which was released on the 19th August. On Saturday (20th), masterpieces by Roger Dean including his painting 'Meeting Place' which was influenced by the Isle of Man and produced exclusively for the Isle of Man Post Office's stamp collection, went on display in the new exhibition in the Manx Museum, Douglas.